This is the Sicilian Fisherman's Wood-Fired Pizza from Coppa. 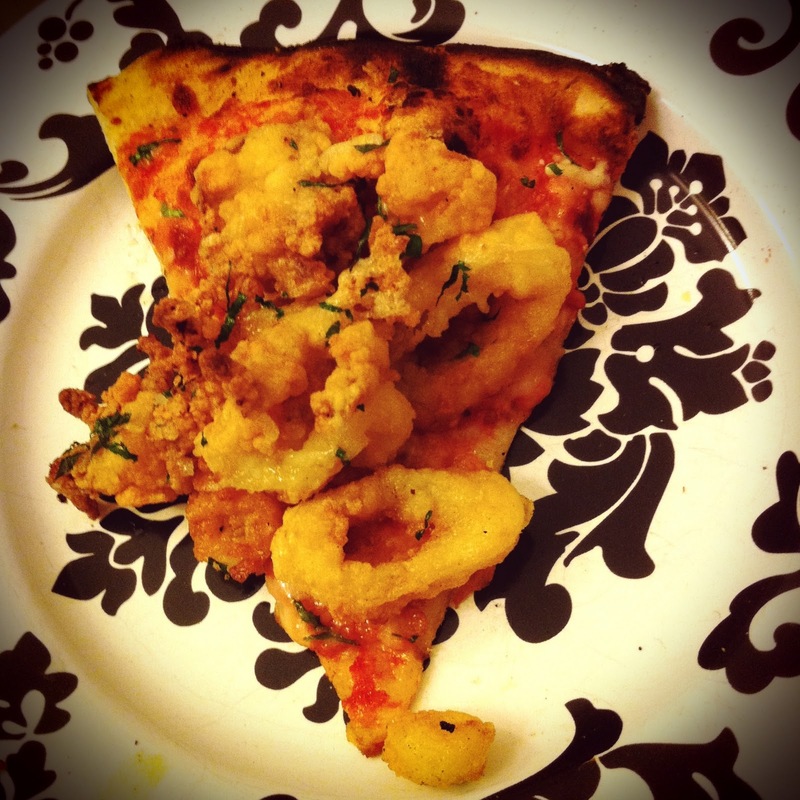 It will be the best fried-cephalopod pizza you've ever had. We went to go check out Coppa this week. I'm glad we did. It's a beautiful, simple, elegant hole in the wall with great music and a yummy, creative menu. We sat at the bar, had a couple of beers and ordered the broccoli raabe antipasti with Meyer lemon and garlic. It was one of the best dressed greens plate I've ever had. Next we got the above photographed pie. This was special not only because it was frikkin' fried calamari on a pizza, but because I've been pondering grilled squid on pizza for a while. I thought it might be too chewy, so this was a way to experience a similar version and test my theory out. The Squid came piled high- tubes, tentacles and all, along with cherry peppers, parmesan and tomato. Each slice was decked out, and the first bite was slightly awkward as calamari toppled over onto the plate, but overall it was an unbelievably delicious combination of flavors and textures. And you know what? The squid that falls to the plate, you just pick up with your hands and eat. No biggie. I didn't find the squid to be too chewy for the application, either. The key here may be the quantity of the squid on the pizza - enough so that you get at least one whole tube with every bite. The tentacles required a little more sophisticated maneuvering, but totally worth it. Big fan of Coppa. Can't wait to try out Toro, with another menu by Chef Jamie Bissonnette. One pie served two of us with leftovers to spare. Made an excellent late night snack AND breakfast.